The 20 Baht banknotes have little change many times. All types of them are as follows. 20 Bath type 1 the lower left is Thai number and Thai alphabet. 20 Baht type 2 change the number at lower left to Arabic. 20 Baht type 3 delete lower left serial number and change the upper right alphabet to Thai. 20 Baht type 4 only code P31 P32 and P33 identical to type 3 with additional serial number at lower left. 20 Baht type 5 identical to type 3 but change serial number to 7 digits and change the color of the back side to orange. Type 1 ordinary number signature Pao EF about 9,500 - 10,000 baht. Type 1 ordinary number signature Pao VF about 4,700 - 5,000 baht. Type 1 lucky number x0000 signature Pao VF about 23,600 - 24,800 baht. Type 3 ordinary number signature Pao UNC about 35,500 - 37,000 baht. Type 3 ordinary number signature Leng EF about 16,500 - 17,500 baht. Type 3 ordinary number signature Kuang VF about 14,200 - 14,900 baht. Type 3 solid number xxxxx signature Kuang VF about 37,800 - 40,000 baht. Type 4 (P31) ordinary number signature Pao EF about 96,800 - 101,600 baht. Type 5 ordinary number signature Leng UNC about 23,600 - 24,800 baht. 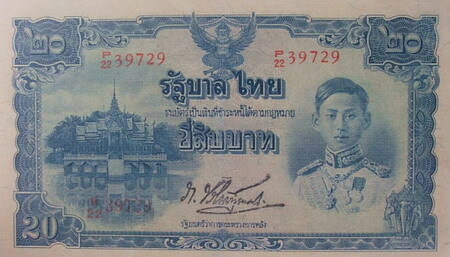 Type 5 ordinary number signature Leng EF about 18,900 - 20,000 baht. The 5th series 20 Baht type 1 banknotes were announced on 18th August 1942. 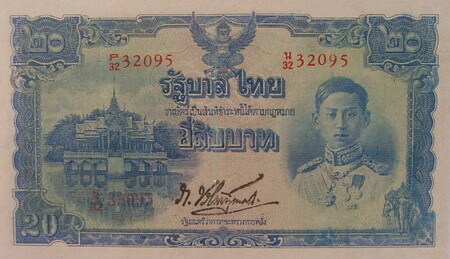 The 5th series 20 Baht type 2 banknotes were announced on 28th Novemberl 1942. 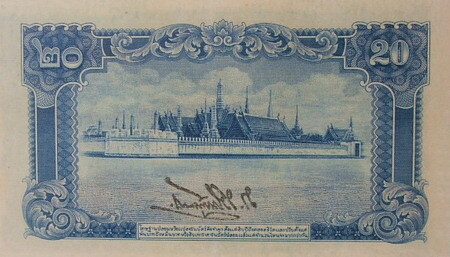 The 5th series 20 Baht type 3 banknotes were announced on 24th Febrauary 1944. 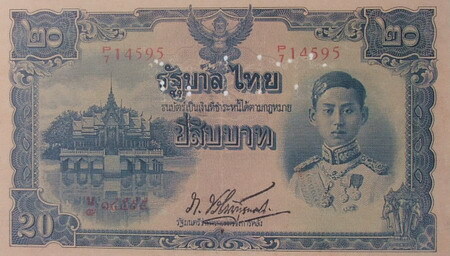 The 5th series 20 Baht type 4 banknotes were announced on 3rd July 1944. 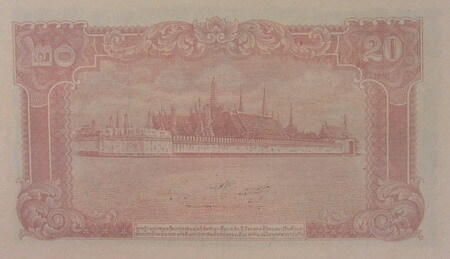 The 5th series 20 Baht type 5 banknotes were announced on 5th March 1945. The main object is the image of King Rama 8 on the right. The left is the image of the Aisawan Tipaya-ast Pavilion. The middle is the "Thai Government" on guilloche design. The serial code and number were printed with red ink. The watermark image is the constitution on pedestal tray.